In addition to my role as "FarmHer" I'm also an English teacher, with degrees in Linguistics and a Master's degree in English. I also served four years in the U.S. Air Force as a Korean linguist--I have a strong love of words, different cultures and languages. We get by with a little help from our friends... and our beautiful community. Huge thanks to each and every teacher who loves these kids and critters and helps make this place feel like one big family. Hello all! My name is Leah; I came to Colorado to attend Colorado State University. My major is Equine Science and I am on the pre-vet track. One day I will become a veterinarian with a mixed practice, which works with large and small animals. I love working with animals, studying them, and educating others about them. Back home in Arizona I was a manager of a small ranch and I loved every minute of it. Upon coming here I knew I would have to find a place just like home. Well it turns out I found something better. I am so thrilled to be at Laughing Buck farm to help educate the community about horses, goats, chickens, pigs, and teach all the fun farm chores! My name is Tatjana and last summer my family and I moved from Texas to Colorado. I love the Colorado outdoors, landscape and lifestyle. I grew up in Germany and during my summers as a child I was exposed to the joys of the farm lifestyle and horseback riding. While I spent much of my youth in Germany, I just recently became a US citizen. This fall I started volunteering at LBF which quickly turned into a teaching opportunity. At the farm I enjoy helping with the chores, animals and most of all spending time with the kids. I like learning and I feel that I constantly experience something new on the farm. Sometimes the kids teach me and I love it. I have 3 children of my own and seeing children having a great time warms my heart. I am looking forward to meeting your children. Hello all, my name is Mikalah. I am a student at Colorado State University double majoring in Equine Science and Marketing. I grew up on a large cattle ranch in rural eastern Washington. I was raised around horses and my experience in the equine industry is very broad. I started as an English rider and have since moved to be an all-around horsewoman. I have experience with cattle work, rodeo, ranch riding, speed events, western pleasure, reining, equation, showmanship, trail (extreme and show), English and have even been a rodeo Queen. In 2013 I started to train professionally with Joe Smith of Lewiston, ID and started showing on the AQHA show circuit. He has sharped my skills to the point where I have qualified for the AQHA world show three times and placed at the 2016 world show. My specialty is ground work and western show events. I have extensive experience coaching my 4-H group and giving lessons to people of all ages in Washington in various events. I believe in teaching a strong foundation, so a rider can be successful in any discipline. I am very excited to be here at Laughing Buck Farm, and I look forward to working with you. I'm Farmer Leah! I'm very excited to be joining Laughing Buck Farm's first ever Integrated farm camp this summer. I get to combine several of my passions: animals, children, and teaching in a natural setting. I grew up on a dairy farm in central Wisconsin where I grew up climbing around our hay barn, taming cattle for the local fair shows, and befriending loads of farm cats. I aspire to have a farm someday where my own children can do this and more! When I'm not planning for farm camp, I work as a school based occupational therapist and my job is very rewarding. I love building connections with my students, their families and get to help shape their success as a student and beyond. I look forward to meeting the farmers very soon! Hello!!! My name is Delia. I am from Idaho and moved to Colorado in 2014 to pursue AG Business. I am a senior at Colorado State University and will graduate in May. 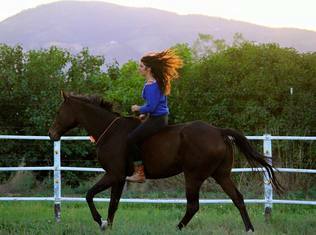 My major is Agricultural Science and I have ridden horses since I was five years old. My horse’s name is Bold Ben he is a registered Connemara and he is 15.1hh and I have shown him in stadium jumping, cross country, and dressage. He is my life. I love therapeutic/adaptive riding, as well as volunteering. I enjoy sharing my knowledge about horses and my passion is equine therapy. I also enjoy packing and outfitting, as well as just ridding for fun. I am so excited to be a part of the Laughing Buck Farm! I look forward to meeting you all! From the time Shirley started coming to Farm School with her granddaughter, we knew she was something special. She shines with warmth, kindness and a gentleness with kids and animals and we would often have her help with classes. We soon learned of her experience with horses, bees, gardening and farming and the next thing you know she had brought her bees and had taken on part of the garden to work with her granddaughter. She and her husband are now raising pigs at the farm and it's a family affair. Shirley is a huge help here at the farm and we are blessed to have her working with the children and animals as a Farm School teacher. My name is Kat, I am a biology student at CSU, and love the natural world. I have been riding horses since I was seven and got my first pony when I was 11. Over the years, I have competed and trained in almost all disciplines of riding. Horses are one of the biggest aspects of my life, I have been in 4H, competed all over Washington State, galloped down the coast at 40 miles per hour, spent many nights sleeping in barns, was a summer camp counselor, and worked on one of the largest ranches in the country. I love spending time outdoors with friends and ponies learning new things. Whether it be giving a five year old their first pony ride or helping more seasoned riders with advanced skills, swapping life stories, learning about chickens and goats, or discussing scientific theories, I am always excited to teach and learn new things. I am so happy to be part of Laughing Buck Farm and its amazing community of teachers, learners, and animals." Hello! My name is Kassidy and I’m a equine science student at Colorado State University! 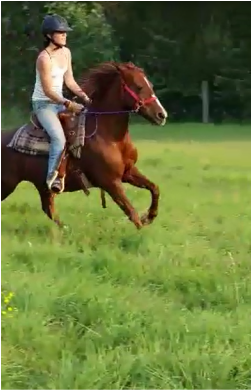 I love my horse, Chance, my family and friends, as well as teaching about horses and the art of riding them! I have grown up in Colorado and worked on ranches and farms continuously since I was 10 years old. I have competed around Colorado in western pleasure, english pleasure, hunter/jumper, barrel racing, gymkhana and many more disciplines. Two years ago I rescued my retired racehorse, Chance, and with some extra food and a lot of love he is healthy, happy and with me as his forever home! I enjoy sharing my knowledge of horses in all aspects - from grooming to riding to anatomy and everything in between. I aspire to be an veterinarian with a specialty in equine reproduction and own my own breeding farm in the future! I am always open to a good conversation about horses or farm animals so feel free to ask me questions or just say hi if you see me around the farm! I look forward to meeting more of you this year through Laughing Buck Farm! 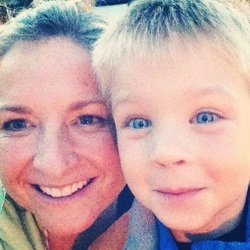 Hi, I'm Kate and I am full of gratitude to be a part of Laughing Buck Farm school this year! My greatest passions are children, animals, and living in connection with our natural world. My most cherished diamonds are the reflections of the sun on a lake when I'm out with my family and I can honestly say I am never bored in nature. The first pig I fell in love with was "Pig Floyd" and when he learned to trust me and let himself be "flopped" I felt radiant with happiness. I view challenges as opportunities for healing and awareness, and I think vulnerability is our greatest strength. I continue to be in awe of how much plants and animals have to offer us humans in areas of self growth and whole hearted living. I believe the farm is the best learning environment imaginable! I love witnessing kids feel empowered, empatheic or joyful during their time learning how to be farmers. As a farm school teacher I bring my background in holistic health and education. I am experienced and committed to working with children with special needs and have had some of my most rewarding and sustained breakthroughs with children on a farm or deep in the woods. "Growing up I spent my days playing in eucalyptus, oak, and persimmon trees, splashing in the creek near my house in what felt like a magical land but was actually the wine country of California. It fostered in me an awareness of our natural world that has guided me throughout my whole life. As an adult it led me to farming and a passion for helping others discover the empowerment that comes from growing their own food. As a farmer, I have found integration and learning opportunities through the foundation of the Herb Oasis Project and involvement with the North American Biodynamic Apprenticeship Program as well as working at many different Biodynamic and Organic farms across the country. I love to connect with young children and their imaginations with the natural world as our guide. Living simply, I spend as much time outside as possible and continue to challenge myself to learn more sustainable ways of living with our natural environment as a teacher and spiritual guide. When not at one farm or another you may find me playing and swimming with my best dog-friend, Bandito, playing music or hiking, climbing, wild-harvesting, and generally exploring new places! With a passion for language, herbs, good home-cooked food, music, movement, growing and a fascination of our deep connection to with the natural world, I am truly excited to be a part the team at Laughing Buck to help foster an environment of learning for all." "My name is Jessie and I am a fourth year equine science student at CSU. I moved to Colorado four years ago from Connecticut, and I instantly fell in love with the Rocky Mountains and the beautiful people of Colorado. I love anything and everything outdoors from hiking to kayaking to camping! I have been riding horses since I was 8. I was trained English hunter jumper, and I showed up until I came out to Colorado. Last summer I worked on a dude ranch in Wyoming where I guided out trail rides and ATV rides, and I had the amazing opportunity to foal out 8 colts and fillies! I have always believed that animals are the best therapy and I love giving back to the community through teaching kids how to care for and appreciate those animals. I look forward to meeting you all and passing on my love and excitement for the animals at Laughing Buck Farm to you!." Look at these faces! I'm sure you can imagine how these two brighten our days at Laughing Buck Farm. 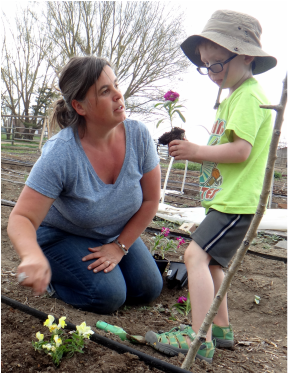 Christine is a natural with kids and her boy is a natural farmer. You can spot him in his cowboy hat and boots (even with shorts), perhaps pulling some kale from the garden for the goats or maybe hugging a chicken. Christine is a natural fit with our farm programs as she worked as the Youth Programs Coordinator at the Gardens on Spring Creek for 5 years. She holds two undergraduate degrees from CSU: Human Development and Family Studies and more recently Landscape Horticulture. She says she has had lots of jobs doing many different things including a summer as a wild land fire fighter. Her very favorite job is being John's mom. Christine loves how her child is experiencing the earth under his feet and the warm sun (or wind, rain or snow!) above his head. He's learning the value (and joy) of work and how to be a good steward of the natural world. Christine believes Laughing Buck Farm provides many opportunities for honing interpersonal skills with children, adults and animals and is grateful for the beautiful space that the farm provides. Christine's pottery can be found at www.Screendoorstudios.com and at The Fort Collins Museum of Art. Angela believes in that children should get dirty, have loads of free play and create early on a relationship with the outside world that they can cherish through the years and into adulthood. If you have been to the farm, you have likely seen Vicky bustling around: gathering eggs, feeding the goats and rabbits, raking leaves, tidying up, and keeping tabs on farm happenings. Known as 'Grandma Vicki' around the farm, she cares for the small livestock (chickens, goats, rabbits, cats), helps maintain the farm grounds, garden and environs, helps with Farm School and jumps in wherever she might be needed. She has lived at Laughing Buck Farm for over three years and knows the ins and outs of farm life and the community. She is vibrant and full of energy, ready to greet visitors with a hello and smile. And if you catch some delicious smells coming from the kitchen, drop in to enjoy some of her amazing cooking! Hello everyone! My name is Natalie and I’m currently a senior at Colorado State University. I’m majoring in English with a concentration in creative writing and plan to make my living writing books. I got on a horse for the first time when I was two years old, and the passion and love for these amazing creatures has been with me ever since. I started helping out at Laughing Buck Farm in the fall of 2013, and I haven’t left since! I love teaching students of all ages, and welcome endless questions and chatter. I learn something new every day, both from my students and these wonderful horses that I work so closely with. I'm so fortunate to be a part of this amazing community which has been so supportive these past few years.